During the recent Sentry Tournament of Champions PGA Tour event in Hawaii, golf fans saw things they might have thought they would never see. 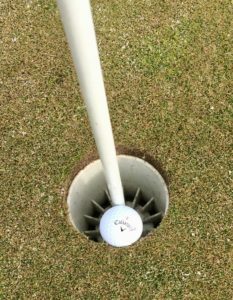 I’m not talking about the 107-yard pitch for eagle on the par 4 twelfth by Xander Schauffle in the final round. Showing off that kind of skill happens often enough on the Tour that it’s not a shock, just a pleasant surprise. However, watching Bryson DeChambeau and other Tour players putt from all over the greens, from short, middle, and long distance, with the flagstick in the hole, was admittedly a bit jarring (excuse the pun). DeChambeau announced prior to the event that he would experiment with the new Rules of Golf change that eliminated the penalty stroke for hitting the flagstick while in the hole, if the putting stroke came from anywhere on the green surface. The United States Golf Association and the Royal & Ancient adopted this and several other rule changes, effective January 1. The goals included speeding up the game, reducing some of the vagaries of the old rules that seemed unfair, and generally making it easier to comply with standards for play. DeChambeau left the flagstick in the hole on many occasions, including short tap-ins from less than a foot away. I watched one of these shots hit the pole and nearly bounce out, so perhaps he’ll think better of leaving it there for the tap-ins. Speeding up DeChambeau’s pace of play, however, remains a work in progress. He and Woodland were put “on the clock” during the third round, so perhaps this Rule change didn’t help that much. On the other hand, he might have played even slower without it. I admit I was surprised to see so many other Tour players leave the flagstick in place during their putts. It actually made sense, however, especially for downhill putts on the huge, slick, windswept greens of Kapalua. From long distance, the flagstick helps golfers with aiming and distance perspective, which is why under the old Rules the caddies often held the stick just above the hole for their golfers. The new Rule also provides a potentially useful backstop for putts that might otherwise roll over the hole and keep going. There is that bounce-off risk, however, such as what almost happened to DeChambeau on that tap-in. The ball nestled in some tall grass, about a foot high, but Tway could see it. He walked a short distance away and took a practice swing or two, in the Penalty Area and in the same type of grass where his ball lay. That kind of practice shot used to be accompanied by a penalty stroke, but no longer. Tway’s eventual chip shot was a good one, landing on the green and finishing in the fringe past the hole. He missed the par putt and made bogey, but under the old Rules the inability to practice a swing in tall grass inside the hazard area would have added to the guesswork. My golf buddies and I are experimenting with the flagstick Rule change in our rounds at Rookery South. It definitely helps speed up the round, which is greatly appreciated when it is 40 degrees out and windy. I haven’t yet had a putt bounce out of the hole with the stick in it. I also made several putts when the ball hit the stick and stopped about halfway down the hole. The new Rule eliminates the need to move (or remove) the stick when that happens, and let it drop. As long as the ball is at rest against the stick in the hole, that’s enough. Just pick it up and go. It’s hard to say that keeping the stick in place will always make putting easier, at least not yet. Golfers should experiment and see what works for them. I think golfers who like their putts to “die” into the hole will adopt the change, while those who prefer to ram their putts at higher speeds will continue to take out the stick. I look forward to seeing how another new Rule change will affect play on the LPGA Tour during their upcoming Diamond Resorts Tournament of Champions in Orlando. I love watching LPGA events, but I never liked the fact that so many players used their caddies to confirm their alignment. Apparently many other people share my feelings about this tactic. The new Rules no longer permit caddies to stand behind the player to help line up. Once the player takes her stance, the caddie must not stand directly behind her, or a two-stroke penalty will be assessed. There’s a single exception when on the putting green. If the player takes a stance for alignment but then backs away and starts over, there’s no penalty if the caddie is behind her for that first stance. We’ll discuss other Rules changes in upcoming columns.